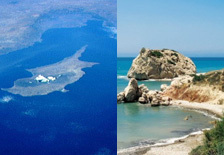 340 days of sunshine, a charming diverse landscape, breathtaking traces of the island’s history spanning 9000 years, world-class hotels, an advanced communications network and heartwarming hospitality – that is what Cyprus is waiting to offer you. A unique blend of carefree Mediterranean lifestyle and European standard services make this ancient ‘Island of the Gods’ an ideal destination. Whether you are visiting for business or leisure, you are bound to discover a wonderful new world. Two international airports – in Larnaka and Pafos – combined with an excellent road network lead you quickly and comfortably to your preferred hotel accommodation.